1. Decide what size you’d like your egg to be and then blow up your balloon. 2. Cut up small squares of kitchen roll. Use the nylon brush within your First Edition brush set and add a layer of First Edition Deco Mache Gloss Adhesive to your balloon. Begin to layer your small squares of kitchen roll to the entire balloon. 3. Once you have completed the first layer, do a second layer and leave it to dry over night. 4. Take your Simply Creative decoupage dragon scales paper and cut it down to small squares. Apply it to the balloon surface with First Edition Deco Mache Gloss Adhesive using your nylon brush. 5. Once complete, leave to dry and apply a second layer to create a denser colour and then leave to dry once more. 6. Pop your balloon and carefully pull it out of your dragon egg design. 7. Add a strip of Simply Creative decoupage paper with First Edition Deco Mache Gloss Adhesive to cover the hole. 8. Once ready, carefully use a craft knife to create a vertical cut on your egg. 9. Paint a layer of Dovecraft gold glitter glue to add a magical feel to your dragon egg! Leave to dry. 10. 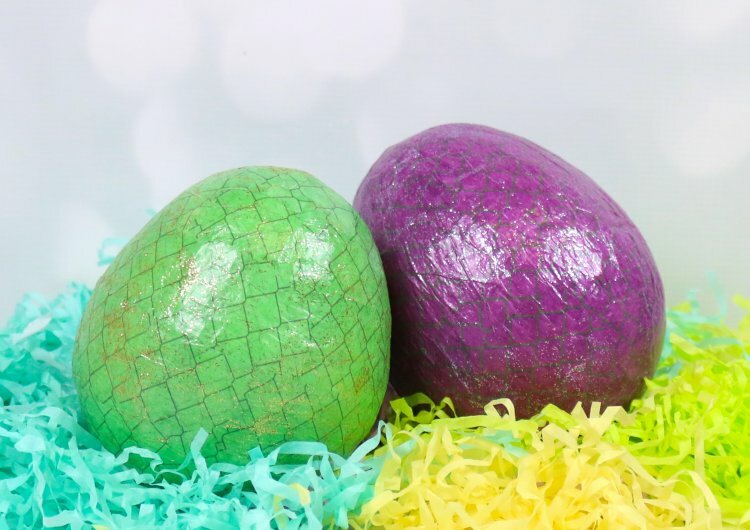 Now your dragon egg is ready to be filled with all of their saved up pocket money! With dragons and fantastical worlds being featured in movies, books and video games, this trendy craft will look fantastic in the kids’ room. To make their dragon egg really sparkle, they could add a selection of Simply Creative gems and pearls! What do you think of this fun money box design? We’d love to see your versions in the inspiration area so remember to add them and when you upload your makes to social media, don’t forget to #Trimcraft!